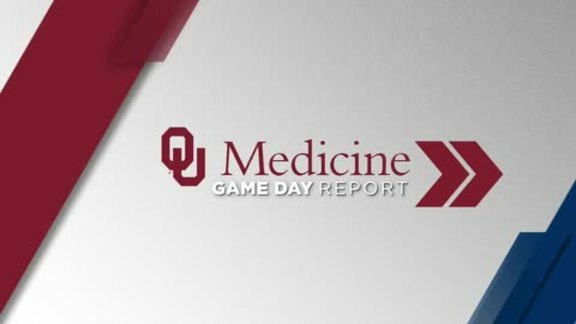 The Thunder picked up its first win on Sunday evening. Billy Donovan wasn’t happy. The Thunder’s 26-point lead was whittled down to 7 as the final buzzer sounded against the Phoenix Suns, meaning there was plenty to discuss amongst the Thunder staff in preparation for the LA Clippers on Tuesday night. Number one on the checklist for the Thunder is eliminating any complacency that can set in once a lead is built or things go the right way for a long time. Then there are specific aspects of the game the Thunder must execute upon every trip downcourt, like generating a high-quality shot by limiting turnovers or playing with precision on defense to get stops. Perhaps the top concern for the Thunder’s head coach heading into the Clippers matchup was the way the ball got into the deep paint repeatedly in the fourth quarter against Phoenix. It wasn’t necessarily because rim protectors Steven Adams and Nerlens Noel weren’t on the floor to loom over the rim as a deterrent. There were breakdowns on the perimeter and in helpside rotations, and that’s something the team is addressing in this rematch with LA. “We just gotta come in focused, come in ready to play and just follow the coaches’ game plan,” said forward Jerami Grant. The Thunder can look to the first three quarters of play against Phoenix as a guide to how they must defend guards like Avery Bradley and Patrick Beverley, in addition to playmaking forwards Tobias Harris and Danilo Gallinari. By utilizing length, strength, quickness and activity in the passing lanes, the Thunder was able to turn the Suns over relentlessly, and it would behoove Donovan’s club to do the same against the Clippers. With stops come opportunities to score, and against the high scoring LA Clippers (116.5 points per game), the Thunder is going to have to get buckets. Getting playmakers the ball while on the move is a surefire way to take advantage of flatfooted or unexpecting defenders. Since Russell Westbrook’s return to the starting lineup, the emphasis for the Thunder to play with pace, keep bodies moving and keep defenders guessing has been clear. There’s a dramatic, noticeable impact when Westbrook shares the floor with Dennis Schröder and Paul George because when the ball comes off the rim, whichever player is closer to the rebound receives the outlet, while the other two play wide receiver, streaking up the sideline into open space. “Anytime you play with some force and there’s ball movement and the guys are catching the ball on the run, you’re always giving the advantage to the offense,” Donovan noted. At present, the Thunder is just in the middle of the pack in fast break points – an area where they’ve typically been a league-leader in the past. It’s early yet, just five games in and two came without Westbrook, but look for the Thunder to push the tempo as much as possible against the Clippers, who with bulky, menacing centers Marcin Gortat and Boban Marjanovic are vulnerable to transition attacks. Waiting for the Clippers’ oak trees in the middle to set up and camp out in the lane won’t be a viable strategy against LA. Slashing through the brush to carve out open space is the winning move. 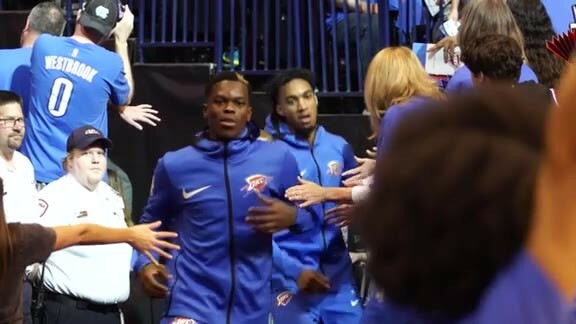 -	As of Tuesday morning, Steven Adams and Nerlens Noel are both listed as questionable for the Thunder against LA, though Adams was seen going through a workout after shootaround. - The Clippers come into the game 4th in the NBA in made free throws, so the Thunder will have to be sure to defend without fouling for the entirety of the four quarters. Particular trouble can occur when fouls pile up early in the quarter, leading to bonus free throws as the period wanes on. - The Thunder has the 7th fastest pace so far this season, but the Clippers are in the middle of the pack, intent on slowing the game down and packing the paint when possible. In order for Donovan’s club to play to its strengths, it has to be relentless in its transition attacks for early offense before the Clippers can set up shop defensively. “We just gotta push the ball, make sure we get the defensive rebounds and run in transition as soon as we get it,” said Grant. 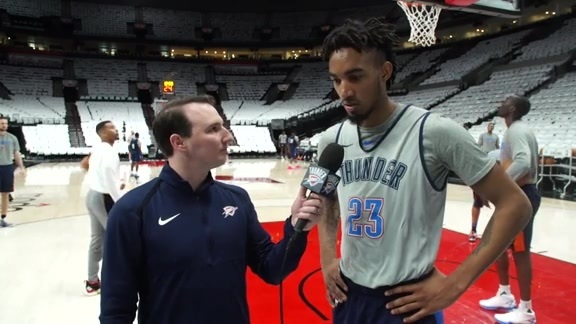 - On Monday the Thunder announced that it exercised its third-year option on current starting shooting guard Terrance Ferguson. The 20-year old Ferguson has appeared in 65 games, including 16 starts, averaging 3.0 points in 12.9 minutes per game. He is just the third NBA player in history to record 24 points and six three-pointers in his first career start, which he made on Jan. 3, 2018 at the Los Angeles Lakers. - While the starter at power forward will still be determined nightly depending on matchups, it seems that Donovan’s decision-making in those game-to-game situations has proved beneficial for both players. Jerami Grant has scored 24 points, grabbed 10 rebounds and made 3 steals over the past two games while shooting 8-of-19 from the field, while Patrick Patterson has knocked down 9-of-15 shots, also scoring 24 points and grabbing 11 rebounds between the Boston and Phoenix games. What could be an awkward situation in many locker rooms has not been one at all, with Patterson gushing about Grant’s performance after the Boston game.